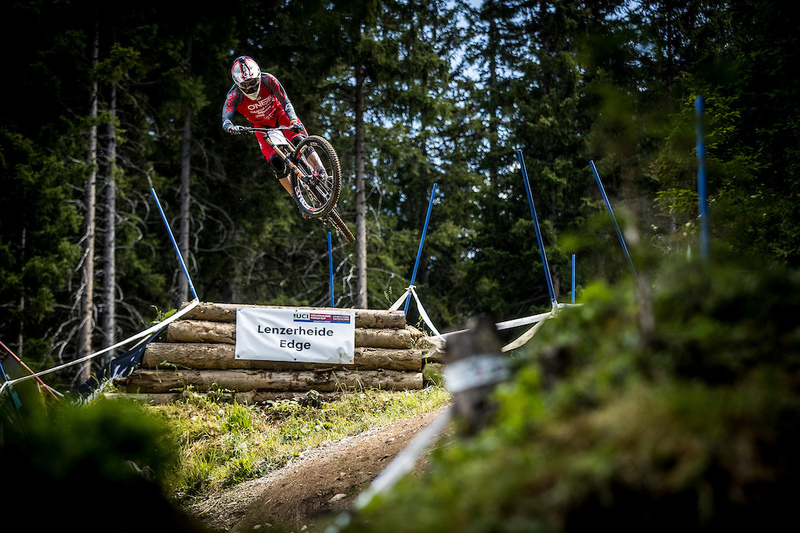 Lenzerheide Announces MTB World Championships Details. The Lenzerheide World Championships looks to be one massive party, where only a few will return in rainbow-striped glory! 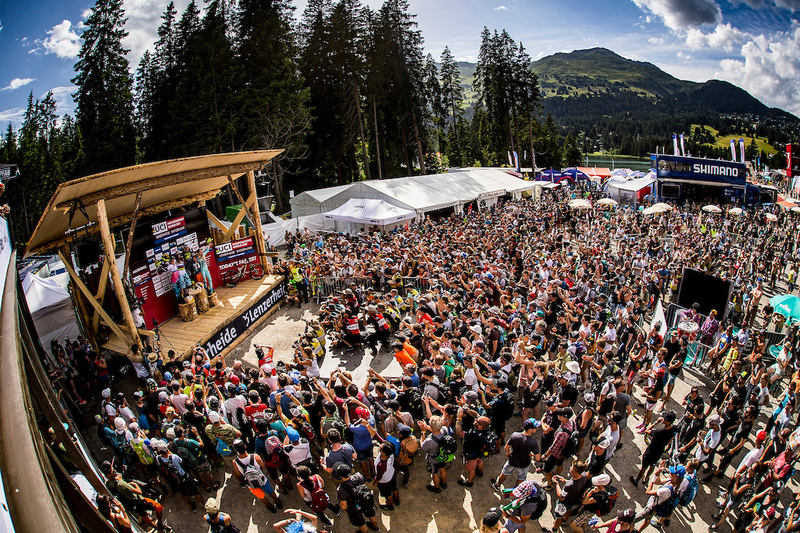 In only a few weeks time, the spotlight will shine on Lenzerheide, Switzerland, where the grand finale of the mountain bike season will unfold. 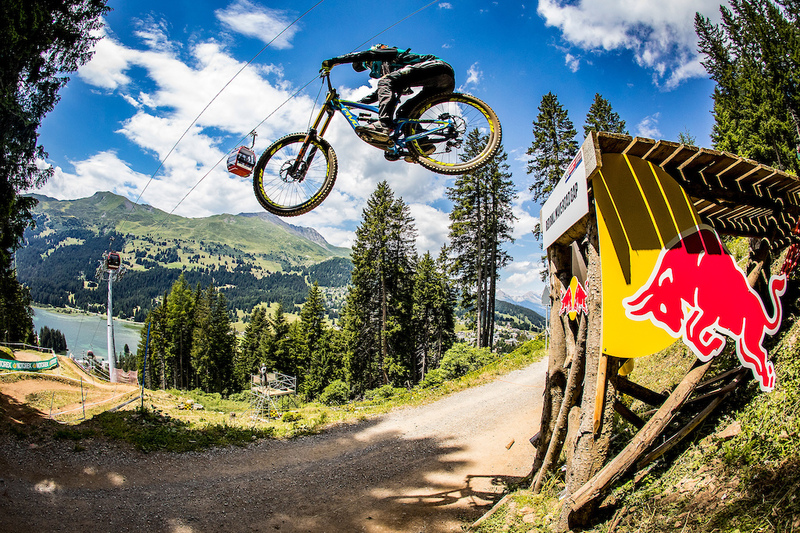 The world’s best mountain bikers and the rising stars of the future generation will be competing at the UCI Mountain Bike World Championships presented by Mercedes-Benz from September 5-9. Cross Country and Downhill athletes will perform in front of 30,000 stoked spectators and fans. Tickets for the whole week or single days are available at www.lenzerheide2018.com. What was your weekend like? A number of memories will most likely cross through everyone’s mind when being asked this question after the World Championships weekend in Lenzerheide: roaring crowds, revving chainsaws, crazy costumes, steezy downhill runs for the history books, pained facial expressions of fatigue on the Cross Country track, champagne showers, rainbow jerseys and plenty of stoke. Being asked this question in a work environment could result in similar reactions as shown in the latest World Championships trailer. 800 helping hands will be working hard over the following weeks and during the World Champs to ensure that the 11 races and 15 hours of race action are successful. Which of the 700 athletes will race to the podium and secure themselves one of the 33 available medals? Take the STRAIGHTline to Gold – Will the injury-stricken strike back? The athletes have two weeks to recover from the World Cup season and prepare before heading to the start gate of the Downhill World Championships at 1,904m / 6,246ft a.s.l. Loïc Bruni (FRA) and Miranda Miller (CAN) will be looking to defend their rainbow stripes from last year, but the competition will be very tough. French phenom Myriam Nicole (FRA) will have her eyes set firmly on the rainbow jersey for the remainder of the season. 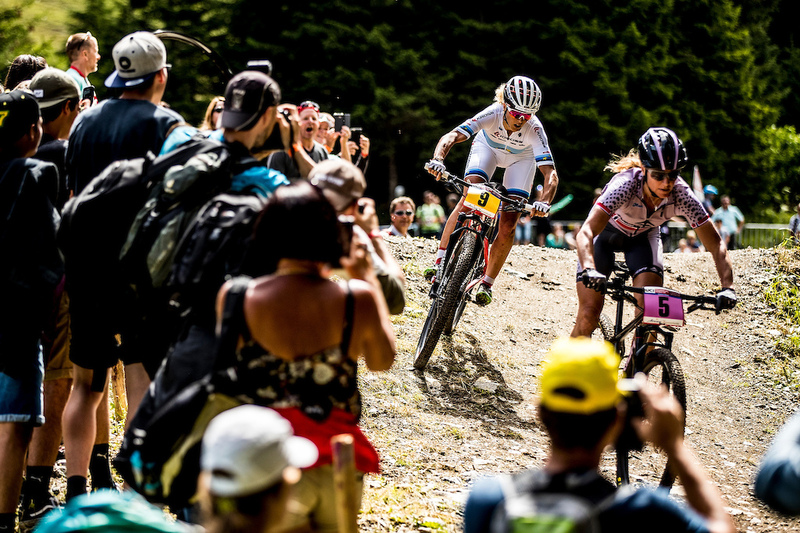 Leading the World Cup, her hopes to defend that title went up in smoke after a crash and the resulting back injury kept her from collecting essential points in both Val Di Sole and Vallnord. Will Nicole be able to put the disappointment behind her after recovering and challenge her competition, Rachel Atherton (GBR), Tahnee Seagrave (GBR) and Tracey Hannah (AUS) at the World Championships? Can she become the first French World Champion since Morgane Charre in 2012? After having come second in the past two years and heading home with a silver medal, Nicole will be eager to make it three times lucky and finally stand on the top step come September 9. A similar case can be made in Men Elite as well. Two Downhill greats will be looking for redemption and will do their best to prevent Bruni from defending his title or stop other big names such as Amaury Pierron (FRA), Laurie Greenland (GBR), Brook MacDonald (NZL), Loris Vergier (FRA) and Troy Brosnan (AUS) from stepping into those coveted rainbow stripes. Both Aaron Gwin (USA) and Greg Minnaar (RSA) fell short due to injury this season and have been forced to give up the race for the World Cup title. The World Championships pose a chance to save the season and even though there are still two World Cup stops before the World Champs, Lenzerheide’s victor from last year, Greg Minnaar, is already eyeing up the grand finale of the season. It is safe to say that the World Championships will be special for every single Swiss athlete that gets picked to ride in their national colors. The Swiss national team will be looking to, at the least, defend the 8 medals won in Cairns (AUS) last year. Emilie Siegenthaler will give the hosts the chance of increasing the medal count this year. After returning from Cairns without a medal in 2017, Siegenthaler has already proven how confident she feels on the STRAIGHTline after speeding into third last year (and downing a bottle of Champagne in one go in celebration). The strong suit of the Swiss will however be the Cross Country disciplines. XCO-superstars Nino Schurter and Jolanda Neff aside, the list of potential medalists seems to be neverending: Mathias Flückiger, Florian Vogel, Lars Forster, Thomas Litscher amongst the men and Linda Indergand, Alessandra Keller (U23) and Sina Frei (U23) amongst the women are only a few names that belong to those capable of seizing a podium spot on a good day. The Swiss are certainly spoilt for choice when it comes to nominating their team for this year’s World Championships. Battle for the ages on the horizon – Who will take the gold? Who will be able to give the local heroes a run for their money? Nino Schurter has been put under pressure all year and his opposition seems to be stronger than ever with the likes of Mathieu van der Poel (NED), Sam Gaze (NZL), Anton Cooper (NZL), Gerhard Kerschbaumer (ITA), Stephan Tempier (FRA) and Maxime Marotte (FRA) all challenging the six-time World Champ at every race so far. Will they be able to rain on Schurter’s parade on his home soil? So far, reigning World Champion Jolanda Neff’s season is going according to plan as she has secured the lead in the World Cup standings. However, the 25-year-old has been pushed to the limit before by her opposition Annika Langvad (DEN), Maja Wloszczowska (POL), Anne Tauber (NED), Yana Belomoina (UKR) and Pauline Ferrand Prevot (FRA) and will have to keep fighting to distance herself from her competition. Exciting racing and epic battles for the rainbow jersey are guaranteed on the 4.2km-long course on Saturday, September 8. Apart from all the race action, spectators can look forward to numerous side events, parties and the 7,500sq m / 80,729sq ft big Expo-Area, where many exhibitors as well as all Downhill and Cross Country teams will present themselves.